I've been training for a half marathon for so long that I've forgotten what it's like to have free time. With my annoying/debilitating ankle injury, and corresponding walking boot/cast (please heal quickly, ankle and tendons), I've been spending less time working out (I <3 you, stationary bicycle) and more time looking for new recipes. I found a recipe for what seemed like an interesting tofu pasta bake using Veronica, my IPhone, and the Whole Foods Recipe app and decided to give it a try the other night. Cook pasta in boiling water. Drain and transfer to 7X11 baking dish. Stir in olive oil and 1 cup pasta sauce. Put tofu, basil, garlic, and half of the cheese in a food processor, or mash by hand until mixture has Ricotta cheese texture/consistency. Spread tofu mixture over pasta and top with remaining sauce (1 cup). I used real cheese on top and in the tofu mixture, although I'm sure it would have been fine with non-dairy cheese. (I was sharing this side with my meatatarian boyfriend and didn't want to weird him out too much.) 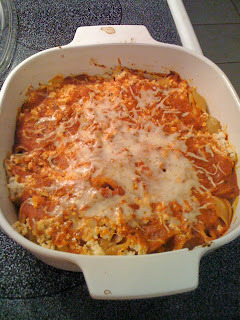 If I were to make this again I'd definitely use fresh basil and more of it. I added waaay more garlic than the recipe called for, and I think fresh basil would have helped the overall flavor. I still thought it was pretty good, though, and I was proud of myself for getting my boyfriend to eat tofu...along with his hamburger. Baby steps to healthier living, right?